A plurality of likely U.S. voters believe that Hillary Clinton should suspend her presidential campaign until all legal inquiries surrounding her private email system are addressed and resolved. According to a Rasmussen Reports poll , 46 percent of likely American voters believe the Democratic presidential candidate should put her campaign on hold. Slightly less—44 percent—disagree. Notably, a quarter of likely Democratic primary voters surveyed contend that Clinton should suspend her campaign amid the email controversy, which prompted the former secretary of state to hand over her server to the Department of Justice as the FBI investigates the security of her email system. Seventy-three percent of Republicans and 46 percent of independents agree. The FBI began probing Clinton’s email system after the inspector general of the intelligence community determined that two of the messages held on Clinton’s private server contain "top secret" classified information. In total, 305 of the emails thus far have been flagged for possibly containing classified information. If discovered to have knowingly sent, stored, or received classified information in a location unauthorized by the government, Clinton could face prosecution. A plurality of voters—45 percent—also consider the national security questions surrounding Clinton’s server to represent a "serious scandal," while 28 percent view the controversy as an embarrassment to the Democratic presidential candidate. 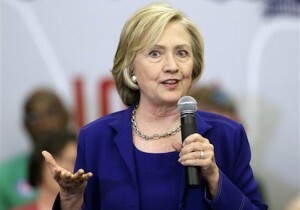 Clinton has repeatedly denied sending or receiving classified information on her personal email account. The presidential candidate has witnessed her favorable and honesty ratings plummet amid the controversy, in addition to losing ground to her competitor, Sen. Bernie Sanders (I., Vt.).